I know I spoke about faith when talking about the belt of truth. The ladies in group had some great points made about the belt of truth. Being the piece that hold it all together and being the foundation of our faith. Today let’s take a look at the shield of faith that we are commanded to take up. First we are going to take a little trip back in time. The day had been long and the warriors were tired however they stood strong, taking up the weight of their heaviest piece of protection. With the enemy looked across the rugged and dusty valley sure of their win. Each warrior with an out-stretched arm resting his shield upon his shoulder as they charge into the battlefield. The warrior in a full force charge knocks the enemy over. He takes out to battle from behind his shield, delivering blow after blow, deflecting arrow after arrow until the battle has been won. They believed in what they were fighting for. They stood strong because of their loyalty. They stood firm with their resources. Does this resemble any of your battles? No, mine either at least not physically. Be sure of one thing, the arrows are flying and they are aimed at all believers. The arrows thrown our way come through disappointments, trials, tribulations, hardships, distractions or anything that would take our focus off of God. These arrows take on many appearances because they are meant to destroy and devour us. They can also just put us into survivor mode; where we don’t seek to grow in God, His will for your life or anything to do with Him and His Word. There are two things in this verse that allows us to thrive: “take up” and “all”. Like the warriors of years gone, we can do more than survive. we have to “take up” our shield, charge into the battlefield and fight for what we believe in. 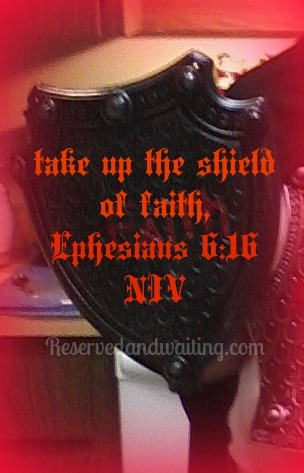 Our shield of faith is God and He is our protection and ALL flaming arrows will be extinguish. Not only will they be extinguished but God will work them towards the good in our life that He has planned out for Himself. Next week we will be looking at Ephesians 6:17. Until we met again, may God richly bless your walk in Him. This post has been share with the Facebook group GROW in His Word. Come over and join in on the discussion or leave your reflection below in the comment area. I would love to hear what God has revealed to your heart. Romans 8:28! Always seem to hear God telling me something different every time I read it. Amen. I love how God speaks to us through His Word. Thank you for sharing.